Dogs are great pets and loyal friends, but they can also cause some problems. Some are very enthusiastic and curious, and they like to explore people’s yards or run up to say hello. Some will dig up yards or gardens or knock over decorations. If your neighbor has a dog, you may be tired of them coming into your yard and wreaking havoc. Even if you have a dog yourself, you may want him to stay away from certain areas of your lawn or garden. There are a wide variety of different animal repellents that can keep dogs away. Some are harmful or dangerous, though, which many people have an issue with. Even if you’re not a dog person, you probably don’t want to use a repellent that could harm your neighbor’s dog. Fortunately, there are humane, safe, and environmentally-friendly options. 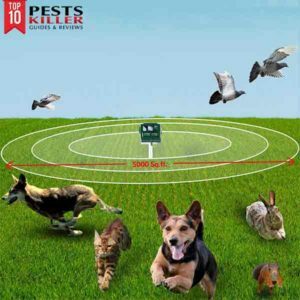 Ultrasonic pest repellents are popular because they don’t harm the animals and they’re completely safe around humans. They don’t use any harsh or dangerous chemicals, so they’re ideal for people with children and pets. Most are solar powered, so they won’t run up your electricity bill or cause any environmental issues. The APlus+ Dog Repellent is a very small, lightweight device, but it has a powerful effect. It uses a combination of sonic frequencies, ultrasonic frequencies, and LED strobe lights to scare away animals and prevent them from returning. 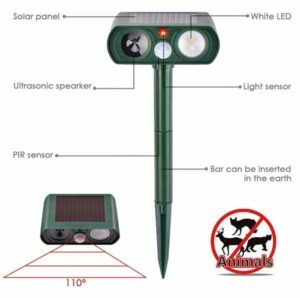 When animals enter your yard, the passive infrared sensor on the device will detect the movement and trigger the ultrasonic speakers. As animals feel the ultrasonic tone, they’ll become uncomfortable and run away. The repellent covers about 750 square feet, so you may need to buy more than one if you have a large yard. It uses three rechargeable batteries, but it can also run on solar energy, so it’s an eco-friendly device. To install the APlus+ repellent, all you have to do is choose your desired mode and attach the device to one of the poles or stakes it comes with. Then, you can stick the device in the ground, mount it on a wall, or set it down on a flat surface. It’s waterproof and weatherproof, so you can keep it outside at all times. The manufacturer provides a 12-month warranty, so you can get a replacement if the device does get damaged by the weather. This repellent works on all animals, so it will keep away other pests besides dogs. However, this means that it might scare your outdoor cats, so cat owners should turn the device off before letting their pets outside. Also, part of the device’s ultrasonic range is audible to humans, so you should keep it as far away from human activity as possible. Putting the repellent in your garden may keep animals away from your plants, but you may hear the annoying high pitched sound whenever you work in your garden. The ultrasonic noise is especially noticeable for kids, so you should keep the device away from areas where your children play. The APlus+ Dog Repellent is affordable and easy to set up. It has great user reviewers and works on a variety of animals and pests. It’s highly recommended for anyone with a pest problem, although pet owners should be careful not to scare their own cats or dogs away. The Wikoo Animal Repellent works just like the APlus+ device. It comes with the repellent, a stake spike, and a USB charging cable. When buying the device, you can choose between three different colors, so you should pick the color that will best disguise the repellent in your yard. To set up the repellent, select the right mode, attach the stake, and insert it into the ground. The repellent also has hanging holes, so you can hang it up on a wall, fence, or tree. The Wikoo device uses ultrasonic frequencies, sonic frequencies, and LED lights to keep dogs and other animals away. The motion sensor has a 25-foot radius, so as soon as an animal comes within 25 feet of the repellent, the lights and high-pitched frequencies will start up. This will scare away the animal and keep it out of your yard or garden. The device is weatherproof and solar powered, so you may never have to take it inside. However, you can use the USB cable to charge it on cloudy days . You can choose between five different modes when setting up the device. To keep away dogs, the best setting is Mode 1, which uses a frequency of 13.5 kHz to 19.5 kHz. This works best for larger animals , although it doesn’t have the LED strobe light feature. If you choose Mode 1, keep in mind that it won’t repel smaller animals like cats, rodents, or birds as effectively. If you have a problem with small animals as well, you may need to choose a different repellent or buy a second Wikoo device and keep it in a different setting. You also could put the device on Mode 5, which cycles through all of the frequencies, but this won’t be as effective for dogs as Mode 1 . Like the APlus+ Dog Repellent, the Wikoo Animal Repellent may sometimes be audible to humans. One reviewer says that he can’t hear the frequency, but his kids can. If possible, you should set up the device away from human activity, so you or your children don’t have to listen to the high pitched buzzing sound all the time. Reviewers unanimously agree that this device helps keep away pests. You may have to move it around a few times to find the best placement, but it should stop all dogs from coming into your yard. 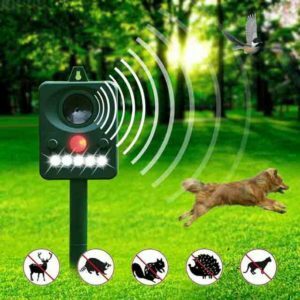 The Eliminator device uses ultrasonic frequency and optional LED strobe lights to scare away dogs and other animals. 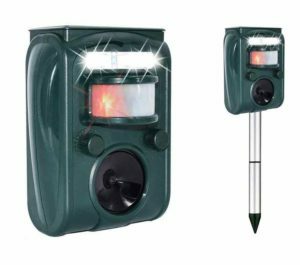 It has an infrared motion sensor that is activated when an animal enters the range. The sensor can detect motion up to 30 feet away. The device comes with a USB charging cable, but it also can be solar powered. When you set up the device, you can choose between three ultrasonic frequencies and seven sensitivity settings. The LED lighting is optional. With all of these features, there are many possible combinations of settings, so you may have to try a few out before finding the one that works best. Most reviewers say that the lower sensitivity settings work just fine , but the higher sensitivity settings may trigger the ultrasonic sound or LED lights whenever leaves fall or a bush rustles nearby. The ultrasonic frequency might be audible to humans. Most reviewers say they can’t hear the sound, but one reviewer says that the noise is very loud when you’re close to it. To be safe, you may want to wear earplugs when setting it up and testing it out. This repellent works on dogs as well as larger and smaller animals, from mice to bears. It’s weatherproof and waterproof, so you can keep it outside 24/7. Although the product is designed for all types of animals, many reviewers say that it works particularly well for dogs. Yasolote Cat Dog Repellent uses an infrared motion sensor to detect animals in your yard or garden. The sensor has a 25-foot radius, and the device should scare off any animals who enter this range. Once the motion sensor triggers the device, ultrasonic waves and flashing LED lights will disturb the animal and scare it away. The device is waterproof, but you shouldn’t completely submerge it in water. To set it up, attach the stake to the bottom of the device and stick it into the ground. You also can hang it up on a tree, wall, or fence. Keep in mind, though, that dogs and other animals will be on the ground. The higher up your repellent is, the less effective the motion sensor will be for detecting movement on the ground. You may have to clean the motion sensor occasionally with a damp cloth, especially after windy days where it may get covered with dirt or debris. When the sensor is dirty, it won’t detect any motion, and the repellent will be useless. The device is solar powered, which is great for easy use and for sustainability. However, unlike most other repellents, it doesn’t have a USB charging cable. Five to eight hours of sunlight should charge it for two or three days, but if you have several days of rain or overcast weather in a row, you’ll be out of luck. Make sure to set it up in an area that gets lots of sunlight to keep it charged . Also, when you first get the device, you’ll have to let it charge in the sun for a day before setting it up. The Yasolote Cat Dog Repellent has excellent user reviewers. Most people use it to keep cats out of their garden, but it should work just as effectively for keeping away dogs. It’s easy to set up, and you shouldn’t have any problems getting it to work. However, the manufacturer offers a one year warranty in case any parts are broken or damaged. 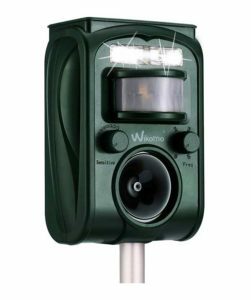 The Wikomo Ultrasonic Pest Animal Repeller is designed with different settings to target all animals, including dogs, cats, and mice. It’s solar powered but includes a USB charging cable for rainy or overcast days. The device uses a combination of ultrasonic frequencies and LED lights to keep animals away from the area, and it should cover about 700 to 900 square feet. The product also has an alarm sound to scare animals in case the ultrasonic frequency doesn’t work. To set up the device, attach the spike, select the desired mode, and insert the repellent into the ground. Like the Wikoo device, this repellent has five frequency settings. Mode 1 is best for dogs and other medium-sized animals. If you also want to target smaller animals, you may need a second device or a different product. Mode 5 cycles through all of the settings and uses the flashing LED lights, but it won’t be as effective for dogs. The Wikomo repellent is made of solid plastic, so it should be waterproof. Most users report no problems with water damage. One reviewer says that they see some condensation on the inside of the plastic, but the device still works. You may want to bring the repellent inside during a heavy rainstorm just in case it’s vulnerable to water damage. This device is highly recommended to people who only have a problem with dogs entering their yard. Other brands might be better for targeting all types of animals, but the Wikomo repellent has a frequency setting that’s designed specifically for dogs. The manufacturer offers a one year warranty and a 100 percent satisfaction guarantee. Most ultrasonic animal repellents work in a similar way. They have a motion sensor that triggers the ultrasonic noise whenever an animal walks by. This noise is usually too high pitched for humans to hear, but animals can hear and feel the tone. It upsets and scares them, so they’ll leave the area immediately. Some also have flashing LED lights that frighten the animals. If the device keeps going off whenever they revisit the area, they’ll eventually stop trying. Ultrasonic repellents are a good way to keep dogs away without harming them. There are some important considerations for choosing the right product, though. The first thing you should look for is the range of the device. Motion sensors and ultrasonic noises will only travel so far, so most repellents cover between 500 to 1,000 square feet. Some are designed to cover a wider area than others, so you should consider the size of your yard or the area you need to be covered when choosing a device. Another important consideration is the frequency. Most repellents aren’t designed just for dogs but for a wide variety of animals, so they may not use the best frequency for keeping away dogs. Some devices have different frequency settings that you can change depending on which animals you have a problem with. You should make sure the device you choose has a high enough frequency to work on dogs. Since dog repellents are meant for outdoor use, they should have a waterproof and weatherproof design. Almost all devices are built with durable plastic that should prevent water damage, but it’s important to make sure that the product is weatherproof. You shouldn’t have to bring the device inside every time it rains or every time you water your lawn or garden. You should also choose a repellent that’s small and portable. Size doesn’t have much effect on its range, so a smaller repellent should work just as well as a larger one. 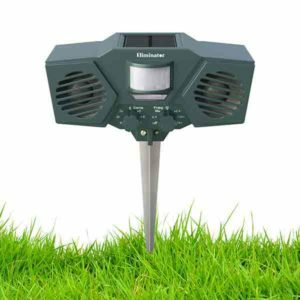 A small and lightweight device is easily portable, so you can move it to different places throughout your yard or bring it with you to picnic areas, campsites, or other outdoor locations. Your last consideration should be the cost. Fortunately, most animal repellents are under $40 and can last for years. You shouldn’t have to buy batteries or replacement parts to keep the device working, so it’s a one-time expense. However, the price is still an important factor for most people. Some repellents are overpriced for what they offer, and some are cheaply made. Make sure the repellent you buy is worth the price. Some brands offer 30-day money back guarantees or one-year warranties in case the product is damaged or doesn’t work. If you’re not completely sure of what device you need, you may want to choose a product with a guarantee or with a good return policy. Choosing a dog repellent is a big decision, so you should look at all the features of a device before you buy it. If you’re on a tight budget, the APlus+ device may be your best option. If you want one device that will scare away dogs, cats, mice, and other pests, the Yasolote repellent is probably your best choice. Or when you’re worried that the ultrasonic frequency won’t be enough to keep dogs away, the Wikomo device with the alarm may be the product for you. The most important thing is that you make an informed decision and that you’re careful when you set the device up. All of the products should come with a user manual with instructions for installing and taking care of the device. Ultrasonic repellents are very easy to use and low-maintenance compared to other products, but you should still be careful. If you set them up properly and take care of them, all of the repellents on this list should work well to keep dogs away and restore your peace of mind. 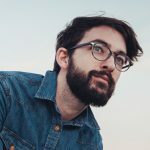 Patric Smith is a 34-year-old blogger. High level of education and experience helped him to become an expert in pests termination. He saved his house from pests - will help you to do the same. Hey! I’m Patric Smith, a skilled pests killer. Cover effective ways of fighting insects, loaders and other pests. Running 10PestsKiller.com and share unbiased guides, reviews and solutions. Some posts may contain affiliate links. 10PestsKiller.com is a participant in the Amazon Services LLC Associates Program, an affiliate advertising program designed to provide a means for sites to earn advertising fees by advertising and linking to Amazon.com.